I have not had proper pani-puri since August! Can you beat that? So, It all started two years back in my Third Year of Engineering. I started traveling 14Km daily (well, almost daily) to attend my college. In those 40 min journeys, I started noticing stalls with small, round, amazingly crispy yellow colored balls and pots full of spicy water. Long story short, I got addicted to pani-puri. 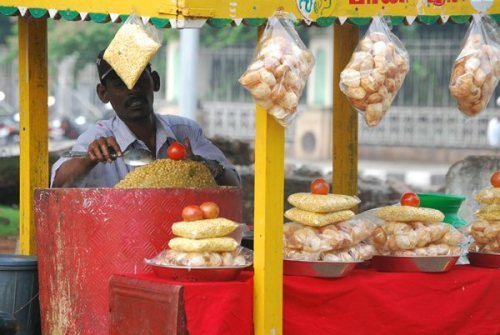 During that one year, I tasted pani-puri in many different areas in Pune. I can count 15 stalls I've visited the moment I think of it. Mind you, I was regular visitor of some of them! Sometimes, I visited new regions in the city just to taste pani-puri at some stall I heard about. Okey Okey. That happened only once. Maybe twice. But that did happen. How I remember that day! Pani-puri is a sure-to-have thing when I go shopping with mom. Now that doesn't happen often, but whenever I do go shopping, I go with pani-puri in my mind. That's my way to survive shopping. That same year I faced severe health problem which resulted in two surgeries. The first one cause of wrong diagnosis. The second one, the result of wrong treatment during the first :P Well, that slightly sobered my obsession. But I still crave for that delicious, mouth watering pure-Indian junk food. Background: This week was my first in ThoughtWorks University (TWU). It is a 6 week long program to introduce freshers to ThoughtWorks(TW) and train them for their roles. So here it goes.. I had not taken my college leaving very nicely. My college was my world and I had to leave it behind. Forever. Chapter 1 of life was over. I needed something to declare this end and mark the start of a fresh chapter.. Chapter 2. TWU turned out to be just the breakpoint I wanted. Back home, I wasn't carrying out my duties that well. It had made me feel dull. A friend said: "Just be no-one for some time. Don't overburden yourself." At that time I wasn't sure if I'll be able to look at myself as a no-one. We all want to be hero of our own story, don't we? But here in TW; I start afresh. As a no-one. We were told during sessions that This is a proving ground. You are not on holiday. I think that's the only thing I do not connect with. I am on a rejuvenation trip here. I don't feel the desire to start with "To Prove". I simply don't want to lose any chance To Learn And Improve; both; technically and personally. Everyone here has something or the other you can learn from them. TW talks about "Best People" as one of their values. You gotta see it to believe it! I can learn so many things from other grads.. let alone the trainers! The first few days we played a variety of games and had some outings. The games involved making our own song and singing it to 'The Song Lord', skipping, darting, wrapping a team-member with paper-rolls to make a human mummy... It all acted as ice-breaker. During a dinner party we girls had a hot-seat session.. We caught as many trainers as we could and one by one made them take the hot seat.. asked them why they looked nervous (with the intension of MAKING them nervous if they weren't).. and fired questions at them! Many of the games/activities revealed talents, skills and interesting facts about people. Aweee! I am surrounded by unique individuals here! We use various techniques to learn efficiently. Most of them are funny and all of them have interesting names. Its simply impossible to explain them in one post. Here are few I thoroughly liked.. There's a Parking Lot. During sessions people ask questions. If the schedule does't permit the trainer to discuss that topic, it gets posted on what is called Parking Lot. Later, when we get spare time between sessions, topics are taken off the Parking Lot and discussed in more details. This way, current session is not interrupted and your doubt is not forgotten. After each session you give feedback. It is divided into four quadrants: Things that didn't go that well, Things you learned and made you happy, Suggestions and Compliments to the speaker. There is Quotations board. People write down all sorta quotes made during the day.. Funny, Embarrassing, quotes introducing a new concept and so on. Then again every day we start with review in the morning, end with feedback, and have energieser after lunch where we usually stand in a biiiig huddle and make fun of ourselves. Yeah.. I had thought TW means a lot of excitement which I may not find pleasant. But back then I hadn't 'experienced' the environment. Doesn't look like things are being forced on me.. I WANT to do things here. Best part is: you may not know exactly what is coming up. Instead, you can be sure that it carries the same ThoughtWorks Spirit in it! It's a collage.. mix of cultures, individuals, practices teams follow.. But everything is part of One Picture. The excitement complements the Collage. The One Picture, in turn, provides the stability that I seek. I'm just 10 days old here. I'm sure things are still to be unfolded. But now I am hopeful that they'll be on the positive side. So. Amazing people, good practices, clearly stated values, healthy pranks and lots of stories! The new chapter begins. Promising to be as fulfilling as the last one. The other day, a friend of mine was playing with my cell phone; calling it "Baba Adam Ke Zamane Ka" piece both for its functionalities and the duration for which I've possessed it; and started playing ringtones (the legacy polyphonic ones) .. which I have used for as long as the handset itself. Suddenly a soft ringtone was played. I looked up from my laptop and said, "This is your ringtone." "Oh!" came the expression and the playing was stopped. I realized the poor person had never thought/known about having a dedicated ringtone in my cell.. LOL!! Material things DO convey feelings, you know. Not that you NEED them for it. I've many times smiled or grinned upon seeing such silly things around..
My birthday gift was kept besides my bookworm roommate's study books when I visited my (ex-)room few months later.. The most amazing applications on my laptop come from another friend; who gave them to me voluntarily, with full confidence that we both have similar liking in those. I guess its so special because I know these things were not done to CONVEY anything. They were simply done. And then something that you awaited comes in front of you.. You raise your hand towards it.. But before you could reach it, it goes away. Leaving you thirstier and hungrier. This keeps happening over and over again. The feeling of 'just missed it..' becomes your companion. "Who are you? You are your habits." My teacher used to say. Whenever I reach the level of a strange pain that can neither be fully felt nor be ignored; these words show me a way of correcting the wrong. Words have a healing power. Just like the evening sky. Just like the presence of a loved one in your mind. Ultimately, every happiness needs to flow out FROM YOU. God embraces you not when you cry out with pain; but when you laugh out with joy. Dear God, Please give me the knowledge to sing your songs.. The songs of joy.. The songs of happiness.. The knowledge; to understand the essence of being human.. I kinda started liking this template I chose the other day.. Its a colorful roll that contains various laces. Nice. I have atleast 20 odd templates downloaded right now. Will be finalizing one when I get enough time to try out all of them. draft.blogger.com : They've got a Template Designer in Layout Manager. Worth a try. This one comes from there. Today i met one of my friends after a long time. Actually i have been meeting him briefly but it has been with a lot of crowd around, or else just to pick up or drop something. Today i got some 5 mins with only both of us and our hobby.. nothing else. no-one else. It was so much better than the hour-long meetings with everyone in the room.. Still, it wasn't enough for me. When i said bye, i kept feeling like going back to him and saying, "the hell! I haven't talked to you since months... You're not going anywhere for next 3 hours!!! :) :) :)" But alas.. Considering the roles we play among ourselves, even though i say lot of funny things to him, i didn't say this one aloud. And walked away. Now i think i'll call him and ask for a meeting anyways. Its just that, well, i don't wanna meet him in crowd. And today looked like last god given chance to meet him on his own..
Certain people have a flavor. A character. A something inside them that becomes their identity for you. And with some people, you can't see it in a crowd-y place. Not seeing it disturbs you. You start missing that person even more. (And you start cracking up about that person!) I don't know if the person in question is aware of this, but for you; you start taking all this affair as a bond that's shared by both of you, not visible to the outside world, not to be touched in presence of anyone who's not part of it, but silently acknowledged in the fashion in which none of you two touches it.